Tap on various parts of photos and images to change the background colour. Sliders automatically match to the background colour you have chosen by tapping. You may use them to further adjust the background colour. Save the image area with a simple frame or with a thin border of the background colour. Saving adds an image to the Camera Roll (Saved Photos) album. Simply save a large swatch of the background colour. Use provided gradient images to focus on effects and play with transparent images. Save opaque versions of transparent images. Paste images from the clipboard. Copy images without the background. FOR ART STUDENTS AND TEACHERS. View fullscreen the effects of different background colours on plain swatches or gradients. Use the app like a colour picker to study the colours in a photo that have contributed to its overall impression. Give yourself an appreciation of what colours make a photo interesting. Add a thin border of a contrasting colour to enhance a photo which has boring colours. Experiment with different mat backgrounds and thin borders as a preliminary to getting your photo professionally framed. By repeatedly saving with background mat and then reloading that saved image you could build up a sort of palette of colours that you like to go with the original. 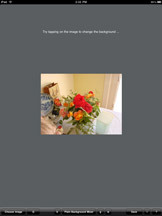 You can then refine your palette by using it to create a 9-colour palette image. Save a background swatch of a colour that you like. Then, in your iPad settings app, simply choose that swatch as home screen wallpaper. This app allows you to copy images. For example you oould copy a gradient image and paste it into CropaRatio. There you could crop it to an area you like and save it before setting it as home screen wallpaper for your iPad. - Use the simple opaque gradients to see how the tone value of the background can distort an image. Notice also the effect of the light and dark sides of the gradient on the background colour. - Make an opaque gradient of a colour that you like by first choosing that colour as the background and loading the Transparent1 gradient image over it. Then save the image area. Reload your opaque gradient before tapping and swiping down to make a palette image of 9 different values of your chosen colour. - Observe the spatial effect of the values of adjacent strips in the provided stepped gradient (Transparent2). Try saving the image area with the stepped gradient, before reloading the saved image and easily creating a stepped 9-value palette image. - Test warm and cool swatches against various backgrounds. Try to match a background to the value of a bright swatch so that they appear on the same spatial plane. 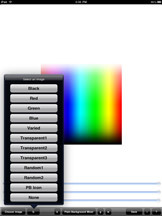 - Create simultaneous contrast effects. One way to do this easily is to start with a light gray background and a light gray swatch which matches it. Then move the sliders slightly and watch the colour effect on the swatch. - Play with the Random1 gradient to see the many different effects of simply changing the background colour of a transparent image. Tap the b,g or w buttons to make a big change in the colour effect of the gradient. The centre of the radial gradient is opaque so you can also tap that to change the background colour. 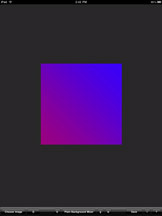 - Use a saved swatch or a radial gradient (Random1) to observe after effects. Such effects are particularly noticeable against a white background. 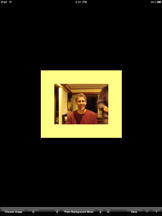 - The provided Random2 image has been included for users to experiment with and see how opaque colours affect each other. For example by moving the sliders you will be able to observe how small changes in a grayish background have a big effect on the apparent lightness of darkness of a colour. 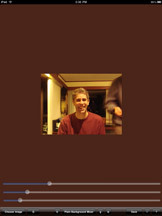 An iPhone/iTouch version of this app called Plain Background Little is available. Click here for more iPad and iPhone/iTouch apps by DARE Software. Have you found that the above suggestions have helped your understanding of colour on devices? Perhaps it is time to try designing with another DARE Software app - ChipScene. Go to this page to see an interesting series of simple design challenges that you could try with ChipScene.